Sixteen-year-old Autumn has spent her entire life worrying about others. Her ailing grandma, meth-addicted mom, and a best friend who is always in trouble. She's spent the last few years attempting to worry less, to be carefree, without success. Enter Evan, whose radiant attitude is an Autumn magnet. With Evan at her side, Autumn's able to let some of her worries go as they trudge through life's difficulties and fall for each other in the process. 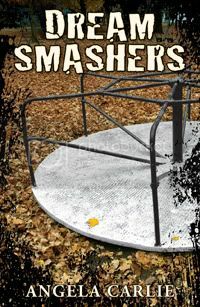 Dream Smashers was a hard book to read, emotionally. I haven’t read many books that have dealt with addiction and its consequences, so this was also an eye opener for me. I’m really glad I read the book. Most of the characters were likeable, and also complex. The main character, Autumn, is a very strong young lady. The girl has been through a lot, but she can take care of herself, along with the help of her grandmother who raised her. Her mother, Jacinda, was a meth addicted mess. It was painful to read some of the stuff Jacinda had put Autumn through. No mother should treat her child that way, and no child should ever have to go through what Autumn went through. I did not like the mom! I enjoyed Evan, and was glad that he was introduced into Autumn’s life. I think the religious perspective that he brought along really helped Autumn out during difficult times, and I liked that. The plot was engrossing, and held my attention. The first half of the book went by a bit slowly for me, but by the second half of the book, I was hooked. The story is told from three different points of view; by Autumn, Evan and Jacinda. Normally I would find this confusing, but the author wrote it in such a way that I had no trouble telling what character I was reading about. Overall, this was a very emotional read, but I am so glad that I had the opportunity to read it. I really ended up enjoying this one as well. I thought it was also nice to get Autumn's moms POV as well. Interesting to see things through the eyes of an addict. Great review! Sounds very intense. It also sounds really good. I like when the multiple character point of view writing is done well. Great review! I'm not sure this book is really for me, but it's really good that you're glad you read it! I've been seeing this one around a lot lately and I can tell that Jacinda is going to be a very difficult character to read about. I don't like her just from the reviews:) Really nice review though Christy, I love a good emotional read! I've never heard of this book before but I'll definitely be adding it to my to-read shelf. Ive not heard of this one before but I think I'll have to add it to the wishlist now! Thanks for a great review! I've had this one on my Nook FOREVER and just haven't been able to read it yet!! I want to read this book!! What a wonderful review, Christy and so very well stated :o]! The subject matter can get quite heavy and it's hard to read about what Jacinda puts Autumn through with her drug addiction. It puts things in perspective. This definitely sounds like a difficult book. I can't imagine having such a horrible mother - or maybe not inherently horrible but caught in addiction. Is it a Christian book with the religious aspect? Wow, sounds like an emotionally-charged book! I'm not sure it's one I'll want to read but I'm sure some of my students would be interested. Thanks for the review! This sounds like a very emotional book. Having Jacinda's viewpoint sounds like it would be very revealing.